Microdacyn60® Wound Care contains the preservatives sodium hypochlorite and hypochlorous acid which ensure the product’s sterility. These compounds are naturally produced as defensive agents by mammalian neutrophils/monocytes as part of the immune system. The primary mode of action of Microdacyn60 involves the mechanical removal of cellular debris, senescent cells, necrotic tissue, and foreign material from the skin and wound surface using a moistened dressing (e.g.gauze) along with irrigation. Removal of these materials through these actions is known to decrease infection rates and improve wound healing. The secondary mode of action is a function of the antimicrobial properties of hypochlorous acid (HOCl) and its salt, hypochlorite (OCl–) (1). These ancillary medicinal substances which are present in Microdacyn60 in very low, non toxic amounts, assist in the removal of microorganisms. 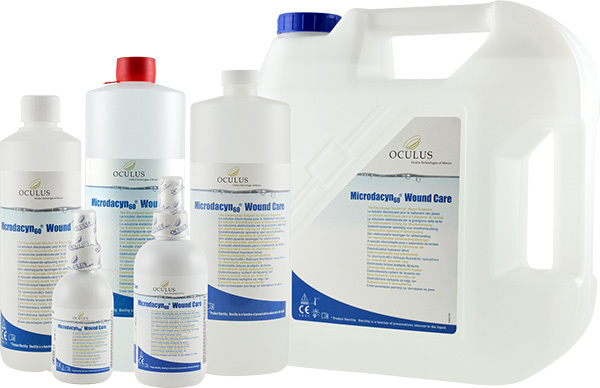 The essential component of Microdacyn60® Wound Care is hypochlorous acid (HOCl). It is an important constituent of our innate immune system and is formed and released by the macrophages during phagocytosis. This represents a significant advantage over other wound-irrigation and antiseptic solutions as highly organized cell structures such as human tissue can tolerate the action of Microdacyn60® Wound Care while single-celled microorganisms cannot. Microdacyn60® Wound Care is tolerated extremely well and has achieved an irrigation threshold of 1.022 in the HET-CAM assay. Due to its unique chemistry, Microdacyn60® Wound Care is much more stable than similar products on the market and therefore maintains much higher levels of hypochlorous acid over its shelf life. Microdacyn60® Wound Care is ideal for use in exposed joints, tendons, bones, and ligaments. In addition, it is possible to use Microdacyn60® Wound Care for installation in negative-pressure wound therapy and in peritoneal and joint irrigation. The preservatives in Microdacyn60® Wound Care, (hypochlorous acid and sodium hypochlorite), guarantee product sterility due to their outstanding anti-microbial characteristics. Microdacyn60® Wound Care eliminates unpleasant wound odors in just a few seconds. The Microdacyn60® Wound Care effect has also been proven under clinical conditions: in a controlled prospective-study*, 90% of patients had a distinct increase in granulation and improvement in the surrounding skin. *Martínez-De Jesús FR, Ramos-De la Medina A, Remes-Troche JM, Armstrong DG, Wu SC, Lázaro Martínez JL, Beneit-Montesinos JV. Efficacy and safety of neutral pH superoxidised solution in severe diabetic foot infections. Int Wound J 2007;doi:10.1111/j.1742-481X.2007.00363.x. Microdacyn60® Wound Care is effective against gram-positive and gram-negative bacteria (including MRSA), viruses, fungi, and spores. More than five million patients have been treated worldwide with Microdacyn60® Wound Care. In Europe, the USA, Mexico, China, India, and Malaysia, more than 40 clinical studies have been conducted—all this without any indication of irritation, sensitization, toxicity or eye irritation. Because of its maximum tolerance, Microdacyn60® Wound Care can also be used with all the usual positive and negative-pressure therapies, such as V.A.C. Instill®. 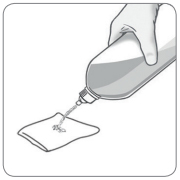 For ease of use, Microdacyn60® Wound Care is offered in a special hanging bottle with a piercing cone. The primary mode of action of Microdacyn60 involves the mechanical removal of cellular debris, senescent cells, necrotic tissue, and foreign material from the skin and wound surface using a moistened dressing (e.g. gauze) along with irrigation. Removal of these materials through these actions is known to decrease infection rates and improve wound healing. The secondary mode of action is a function of the antimicrobial properties of hypochlorous acid (HOCl) and its salt, Hypochlorite (OCl–) (1). These ancillary medicinal substances, which are present in Microdacyn60 in very low, non-toxic amounts, assist in the removal of microorganisms. The Microdacyn60® Wound Care wound-irrigation solution facilitates the mechanical removal of microorganisms and cell debris. Microorganisms are rinsed away with Microdacyn60® Wound Care as are other soluble components. Microdacyn60® Wound Care can also be left on the wound for softening. Please login or register here to view this content. Rinse the wound with Microdacyn60® Wound Care and let it take effect briefly; the process can be repeated up to three times daily or whenever the bandage is changed. Alternatively, the wound can also be cleaned with compresses soaked in Microdacyn60® Wound Care. 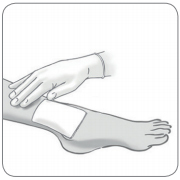 Adhering bandages can be loosened easily and without trauma using Microdacyn60® Wound Care. To support mechanical wound cleansing, the working time of Microdacyn60® Wound Care can be extended to 15 minutes. A. Irrigate wound with Microdacyn60® Wound Care and let it take effect for 15 min. B. Clean wound with a compress soaked in Microdacyn60® Wound Care. C. if needed, spray first Microdacyn® Hydrogel on the wound and apply bandage as usual.